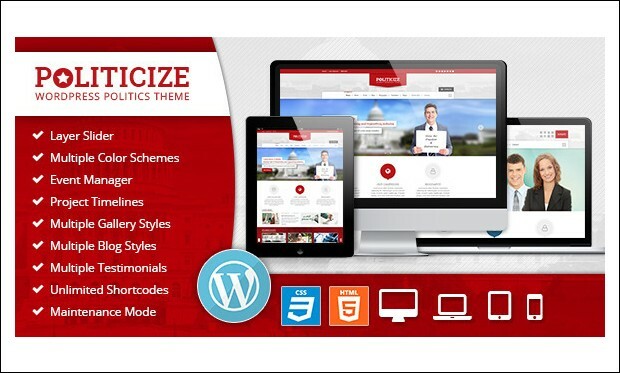 If you are a politician on look out for a perfect theme for your website then this handpicked collection of premium Political WordPress Themes can come in handy. WordPress is a powerful platform that boasts of flexible and great features for easy creation and customization of the website. 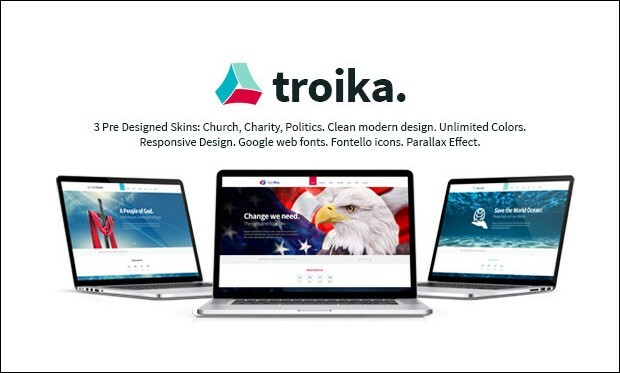 These themes can be used for launching political campaigns, social and other political related websites in a clean and professional manner. Get started with your own political website by merely installing and setting up this theme without wasting huge amount of money. Majority of these themes comes integrated with PayPal for accepting donations in a secure way. You can add social media icons and showcase achievements and policies on your site. 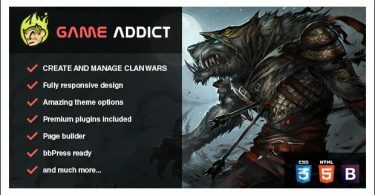 Key features are responsive layout, event calendars, theme customizer, search engine optimization and donation manager. Now, have a look at these 30+ Best Political Responsive WordPress Themes. 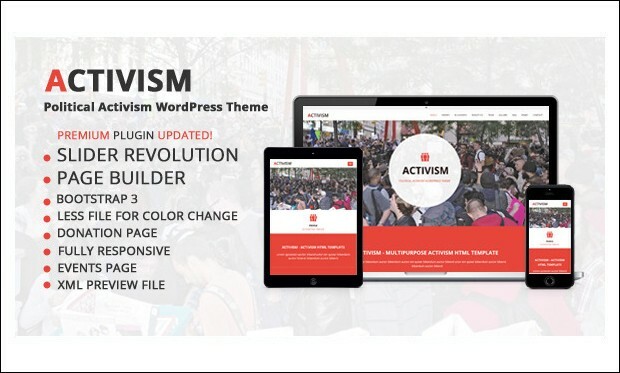 Activism is the clean and fully responsive political activism wordpress theme for political parties or other non-profit organizations. It has all the advanced features and plugins packed in it to create the most powerful website for political website. 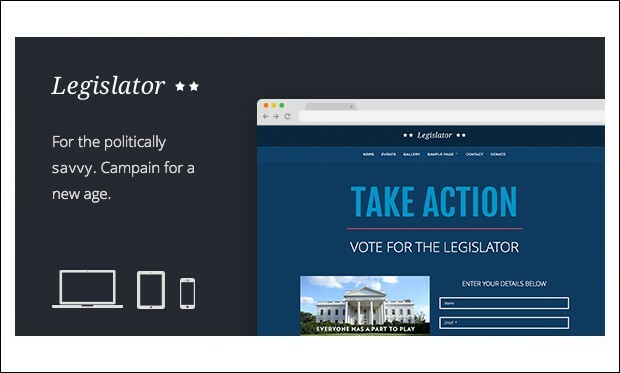 Legislator is the flexible and powerful wordpress theme for the political parties, politicians and government agencies to campaign to the masses in an bold and professional way. Its features facilitate the easy interaction with the candidates or organization. 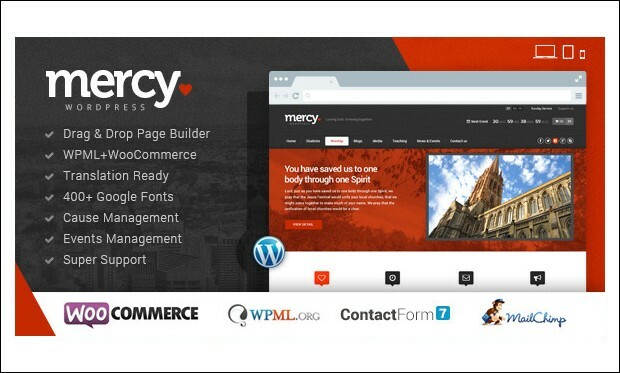 Mercy is the clean and feature packed wordpress theme developed mainly to setup the political and charity websites. It has many advanced features that help in very easy creation of the website that is both beautiful and fully functional. Are you planning to campaign your political party using the internet? 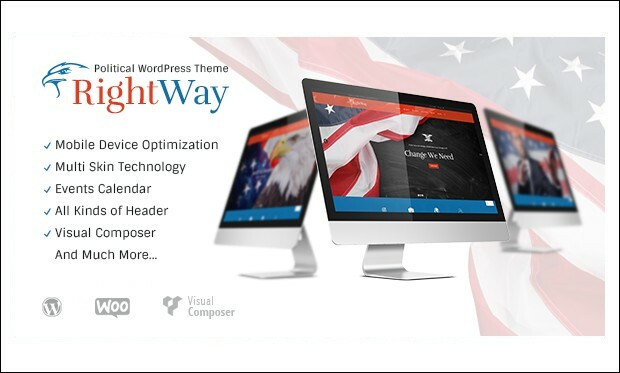 Right Way is the perfect wordpress theme that acts as a perfect platform for you to create the website that showcases everything that is needed to campaign your political party. 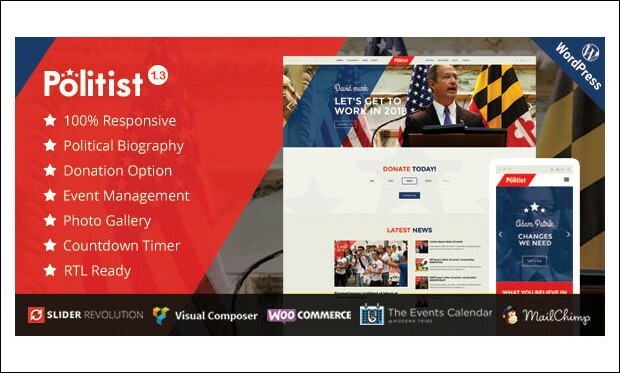 Politist is the powerful and responsive wordpress theme that is specially built for political parties and politicians to campaign for election in an easy and modern way. It has many built-in features and functionalities that are perfect for creating the political website. It’s a bold and attractive political theme that is compatible with the modern version of WordPress. 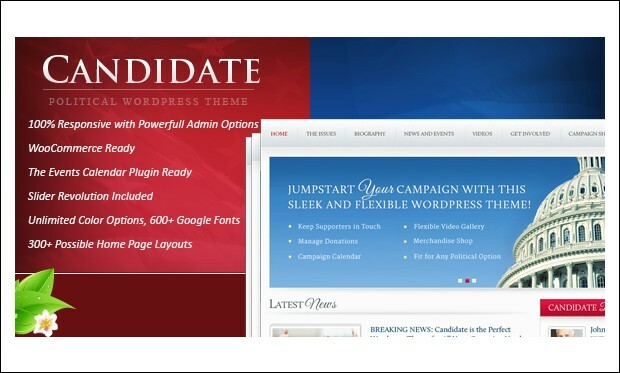 This theme is suitable for political parties, NGOs, election campaigns, government, party candidates and other niches. It includes fully functional donation manager for collecting donations from supporters. It supports Right to Left (RTL) languages like Arabic, Hebrew, Persian etc. 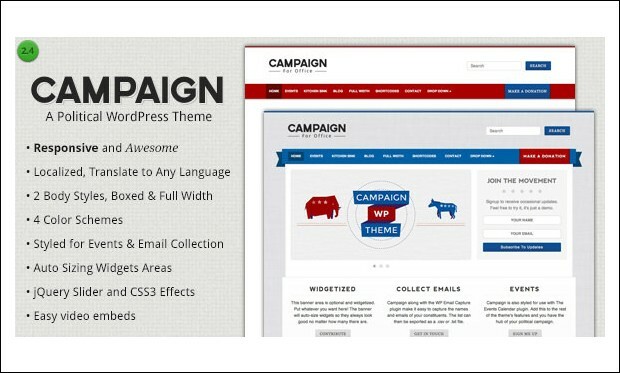 Campaign is a clean and simple political WordPress theme that is built on WP Email Capture plugin. This responsive theme looks fabulous on iPhone, iPad, desktop, laptop, smartphones and android devices. You can easily setup the theme by following simple instructions. Design your site by using 6 background patterns, 2 content layouts, 2 body styles and 4 unique colour schemes. 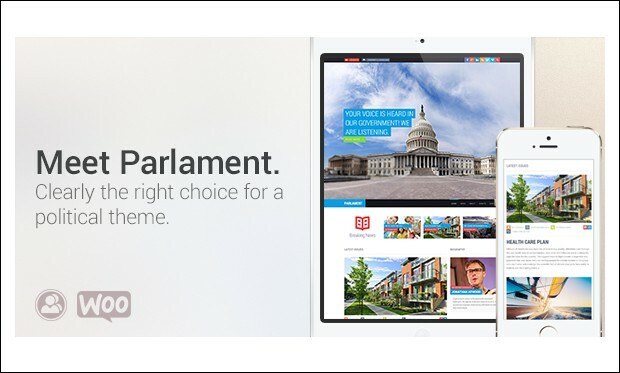 Parlament is a beautiful political WordPress theme from Theme Forest. It comes packed with easy to use features to help you with easy creation of the website. This fully responsive and retina ready theme perfectly adapts onto devices of diverse screen resolutions and looks sharp and pixel perfect on them. Different post formats are standard, image, gallery and video. 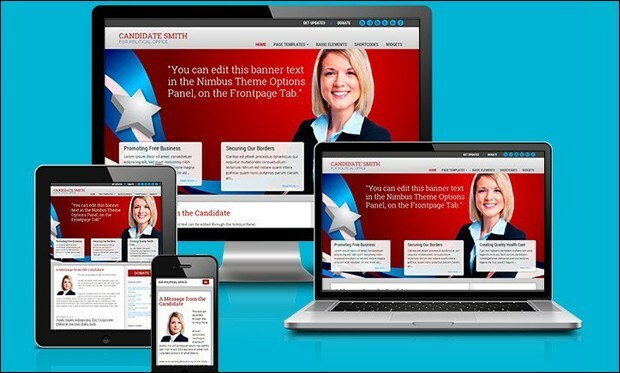 It’s a renowned political WordPress theme that is built on bootstrap 3 framework. This theme is WooCommerce ready to help you build an eCommerce website and finance your cause. It comes up with revolution slider for creating slides with stunning animation effects. You can translate the theme to other languages. 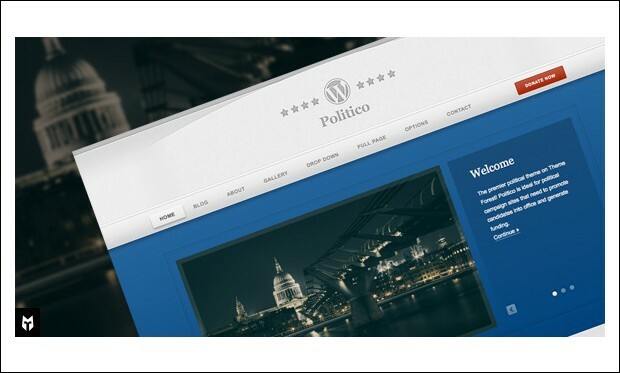 Politico is an attractive political campaign WordPress theme designed to capture visitor’s attention towards the website. 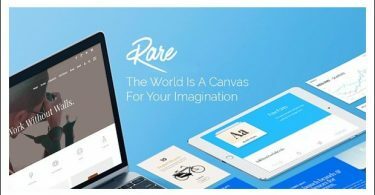 Due to its fully responsive and retina ready feature, the theme looks and works great on iPhone, iPad, smartphone, tablet, android and personal computer. This theme lets you customize election countdown and donate now button. It includes nivo slider and dual slider for creating mind-blowing slideshows. 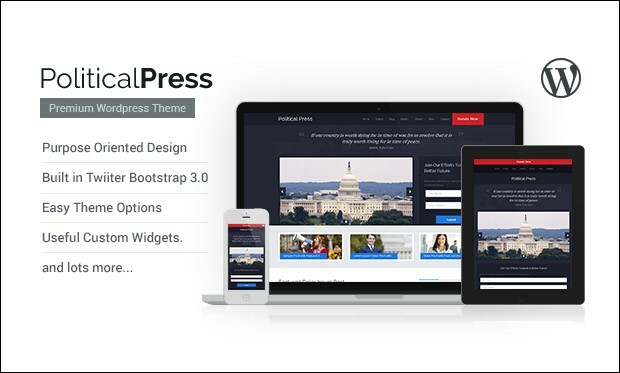 Built on Twitter bootstrap 3.0 framework, Political Press is an amazing WordPress theme mainly designed for candidates to build political campaign website. You can configure and customize every aspect of the theme with the help of comprehensive set of theme options. It is compatible with WPML plugin for translating posts, pages and other elements of the theme to any language. 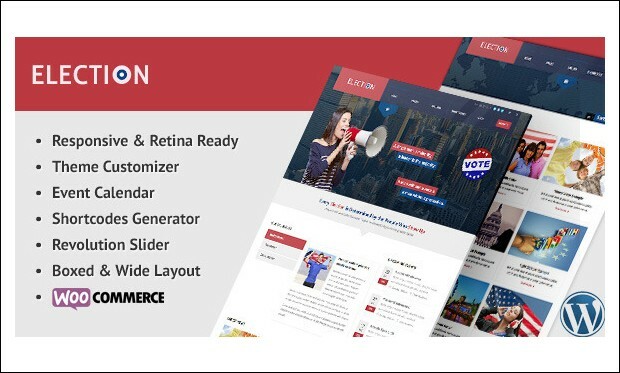 Election is an impressive and eye-catchy WordPress theme designed keeping in mind the needs of political bloggers and political candidates to help them build their own website in no time. By using theme customizer, you can customize the look and feel of the site and preview the changes made to it in real time. If you face any issue then check out the video tutorials that can come in handy. Westand is a beautiful multipurpose WordPress theme designed for charity, NGOs, political, non profit organizations, church and donation websites. It comes with advanced page builder to help you create multiple page layouts by simply dragging and dropping the canvas on the page. This theme is built with HTML5 and CSS3 techniques. It is WPML plugin ready and supports RTL languages. 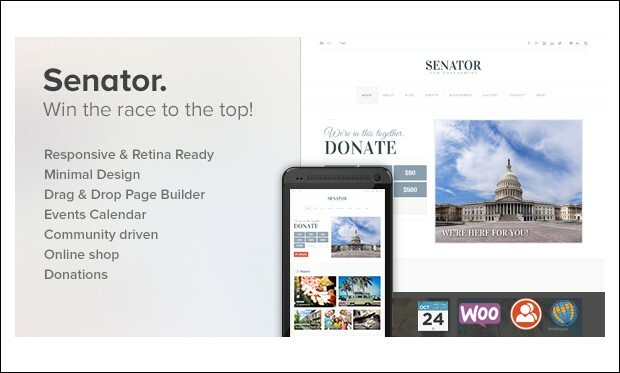 Legislator is a stylish and modern WordPress theme designed for politicians and government agencies. Design your site by choosing from blue, red, green, purple, dark, and light colour schemes. You can easily accept donations and add events onto the site. It is built on Foundation 5 framework. Different custom post formats are standard, aside, images, quotes and links. It supports Mailchimp for collecting emails. It’s a clean, simple and minimalistic designed political WordPress theme with responsive and retina ready layout to let your site perfectly adjust onto various screen resolution devices. Get started with your own website in minutes by downloading this theme at $58. 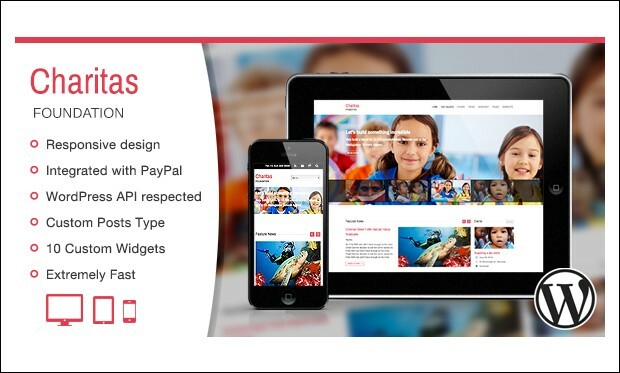 It features BuddyPress, WooCommerce, aqua page builder, CSS3 transitions and animations, theme customizer and search engine optimization. 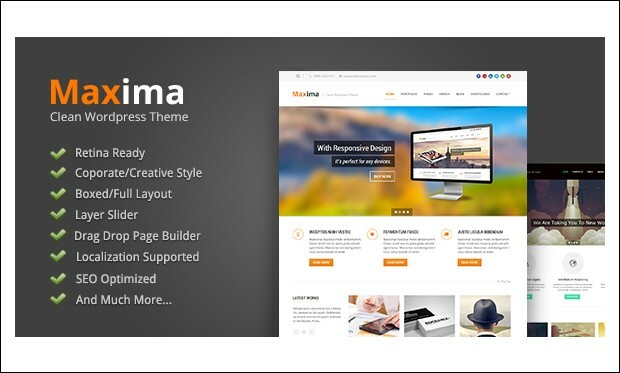 This retina ready WordPress theme is coded with the modern HTML5 and CSS3 techniques. You can import the dummy data in one click to make your site look similar to the one shown in live preview. Key features are layer slider, event management system, Typekit fonts, slider manager, thumbnail options and Facebook fan page compatibility. You can add social share buttons on posts for sharing them over the web. Mercy is a bold NGO charity, environment and political WordPress theme that is based on the bootstrap framework. This theme allows you to add as many causes as you wish and accept donations via PayPal. It includes advanced page builder to help you create, resize and arrange the page elements via drag and drop canvas. Premium users are provided with life time free updates. This theme is suitable for creating political, activist, charity, cause and other similar kind of websites. It is based on Vamtam Rock Solid theme framework and lets you choose from 960 px, 1140 px and 1260 px resolutions. 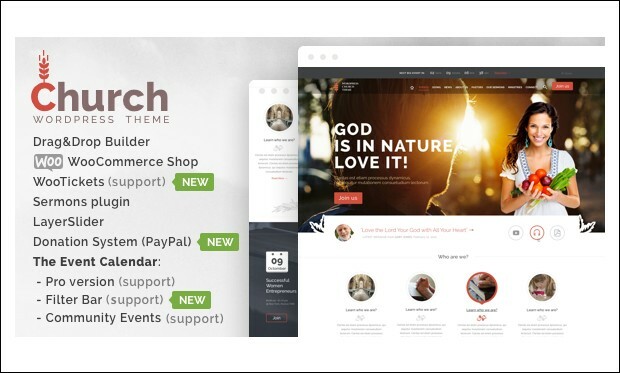 Church and Events theme is optimized for speed and comes integrated with PayPal for accepting donations. The dedicated support team provides users with 24/7 unparalleled help in getting their queries solved. 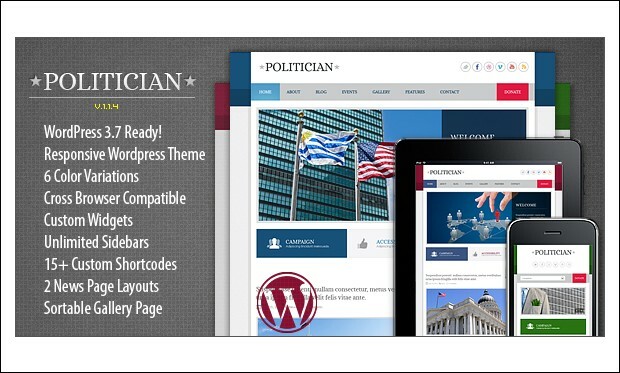 Politician WordPress theme provides visitors a great web experience with its clean edges, contrast backgrounds and content areas. This theme is compatible with major browsers like Google Chrome, Firefox, Safari, Opera and Internet Explorer. If you encounter any issue then make use of the extensive video documentation to help you get started with your own site. 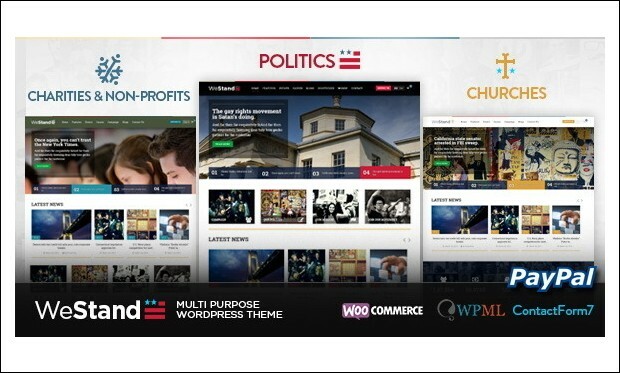 Charitas is a fully responsive WordPress theme well suited for political organizations to help them build their own website in no time. This feature rich theme comes integrated with PayPal for following all successful transactions and adding manual payments. The automatic progress bar displays the total amount whenever new donations are made. You can build multilingual site as this theme is translation and internationalization ready. 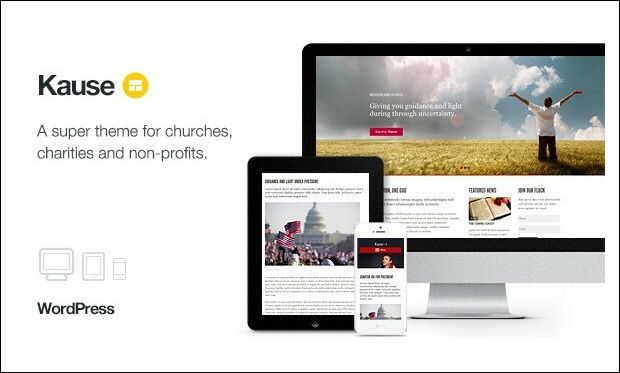 This minimalistic designed WordPress theme works great for political, church and charity organizations. Design your site by choosing from 3 pre designed skins, unlimited colours, backgrounds, fontello icons and Google web fonts. It is built with SEO best practices in mind and compatible with All in One SEO Pack and SEO by Yoast plugins. 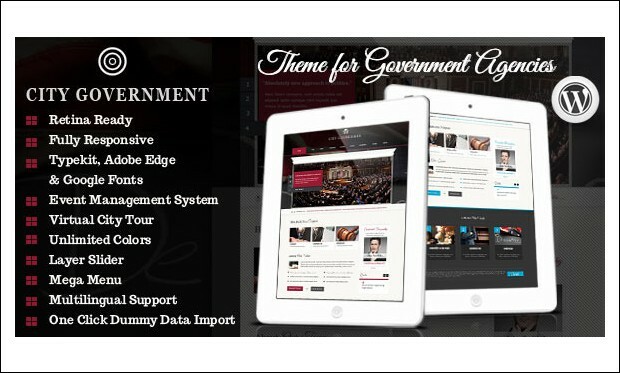 This responsive WordPress theme can be used for building any type of website from political to spa shop. Beginners as well as advanced developers can customize every element of the theme without touching any coding line. Use revolution slider to create awesome slides with stunning animations. The theme is WooCommerce ready, translation ready and SEO friendly. 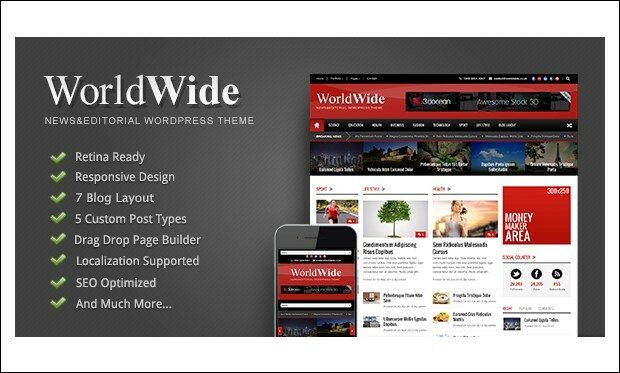 World Wide is an attractive WordPress theme especially designed for crafting political related websites. It includes responsive and retina ready layout to enhance the appearance of the site on desktop, laptop, tablets, smartphones, iPhone and iPad devices. You can change and manage colours, 15 background patterns, 6 footer layouts, 500+ Google fonts, 7 blog styles and add Google analytics via advanced admin panel. 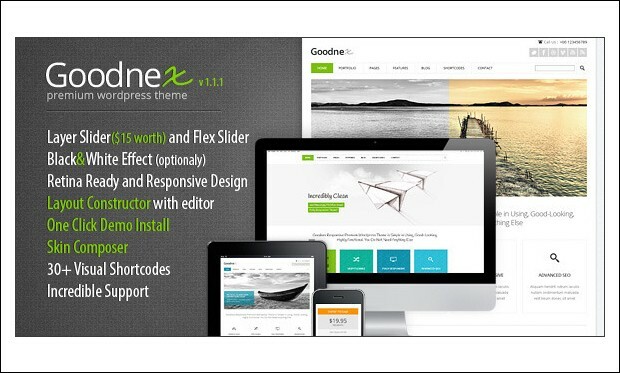 Goodnex is an amazing WordPress theme that comes loaded with some powerful features to help you with easy creation and configuration of the theme. You can make use of the detailed documentation and video tutorials if you face any issue with the theme. This theme is tested to run well on popular browsers like Google Chrome, Firefox, Safari, Opera and Internet Explorer. It includes .po files for translating the theme to other languages. Kause is a multipurpose WordPress theme designed to impress visitors the minute they land on the website due its responsive and retina ready layout. 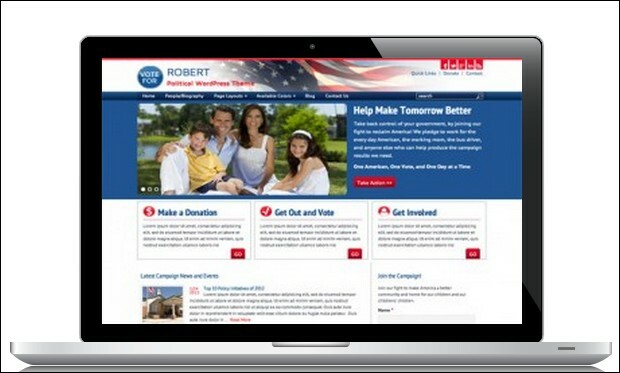 This theme works great for those who want to run political campaign websites. You can embed media from YouTube, Vimeo, Google, SoundCloud etc into your site. Visitors can touch and swipe on the sliders for easy navigation. 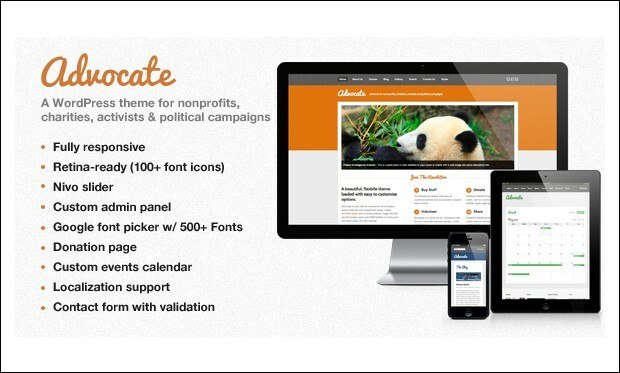 This WordPress theme is an ideal solution for political campaigns, activists, charities and non profit organizations. It features custom events calendar for adding multiple events with venue location, address, date and time. It is equipped with an Ajax contact form with validation. You can even add Google map to the event to help visitors track down the location with ease. Robert is a responsive and mobile friendly WordPress theme that is based on Genesis framework. Give your site a unique look and feel by choosing from red, white and blue colour schemes. Download and install this theme at a reasonable price and you can avail PSD and XML files for easy customization of the site. It is SEO friendly to allow search engines to crawl and index the site. 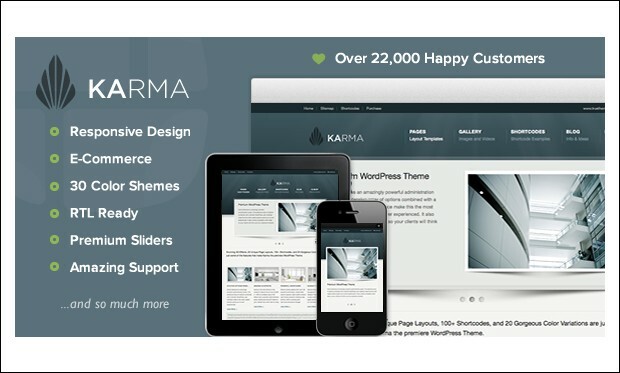 Karma is a beautiful WordPress theme that comes jam packed with lots of useful features to make your site stand out from the crowd. Get started with your own site in no time by installing and customizing the theme without worrying much about the coding part. It is developer friendly and loads the pages quickly. This theme fully supports Right to Left (RTL) languages such as Arabic, Hebrew etc. It’s a smart and decent looking theme that is compatible with the latest version of WordPress. 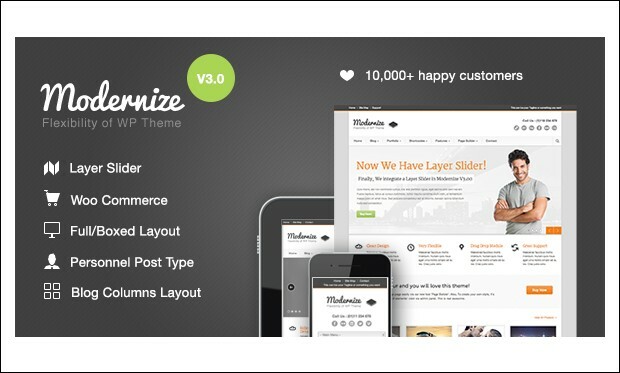 Modernize theme supports WooCommerce integration to transform your simple site to a powerful online store. You can choose from 15 predefined backgrounds or use your own background via custom background uploader. It is SEO optimized to improve your website ranking on Google, Bing and Yahoo search engines. It’s a responsive multipurpose WordPress theme coded with HTML5 and CSS3 techniques. With this theme, you can build a fully functional website without any HTML or CSS coding knowledge. It comes with powerful WYSIWYG content composer to help you create layouts and insert tables, sliders, media, featured blocks etc. 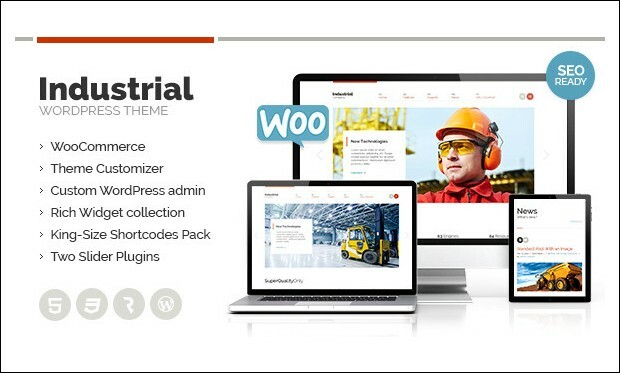 Industrial theme includes Super Extended Shortcodes pack to improve the overall functionality of the site. 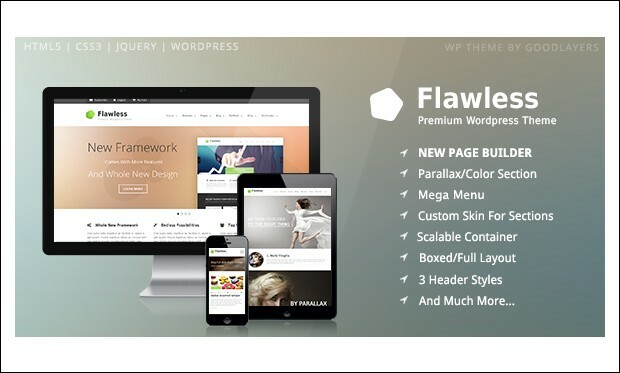 Flawless is an elegant multipurpose WordPress theme that comes loaded with a wide range of useful features. This theme allows you to enable or disable the header and footer for creating landing page templates with ease. You can input data related to quotes, link, gallery, audio and aside using custom post formats. It supports WooCommerce and WPML multilingual plugins. This clean and beautiful WordPress theme is another best solution for building political related websites. Impress your visitors by managing every slider element since this theme comes integrated with layer slider drag and drop module. You can add social share buttons for posts and social links on header of the site. If you encounter any issue while setting up the theme then the theme’s video tutorial can come in handy. 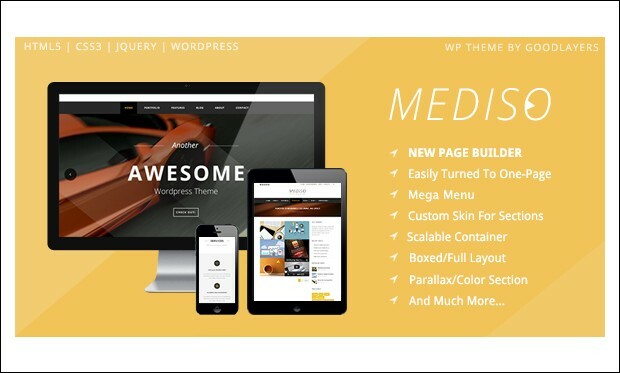 Mediso is a one page, corporate and blogging styled WordPress theme that is built using GoodLayers framework. 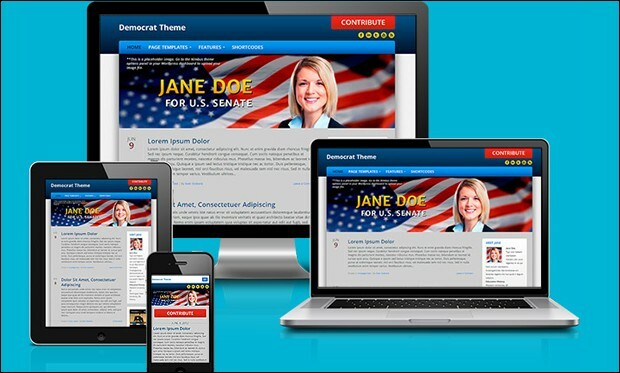 Install this theme and get your political website running out of the box in no time. This fully responsive theme makes your site perfectly adapt to different screen sized devices ranging from large desktop computer to small mobile gadgets. You can embed YouTube video for backgrounds and place logo at left, right or center position. 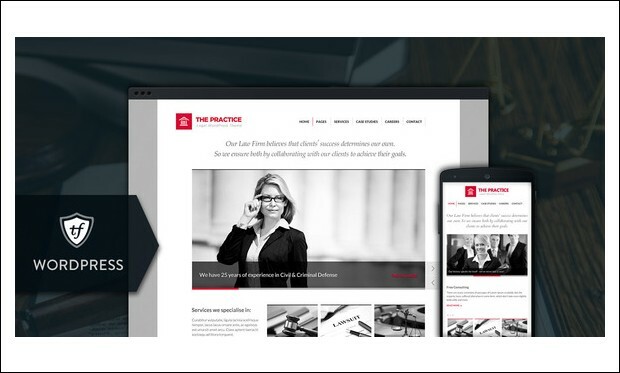 The Practice is a modern WordPress theme with a clean and striking look. Visitors are provided with great viewing experience due to its responsive and retina ready design. It comes up with HTML5 animated slider for adding smooth animation effects onto the website. 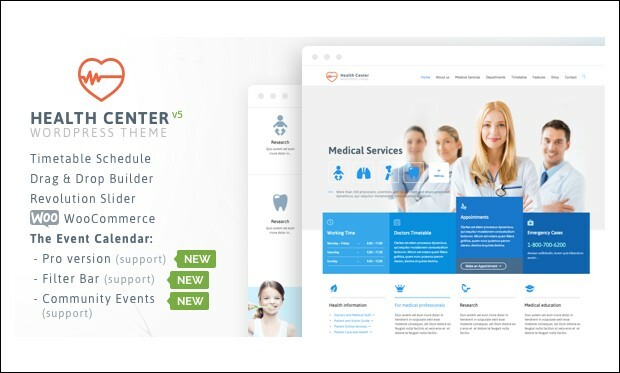 This theme features built-in page layouts from about us to case studies and services. 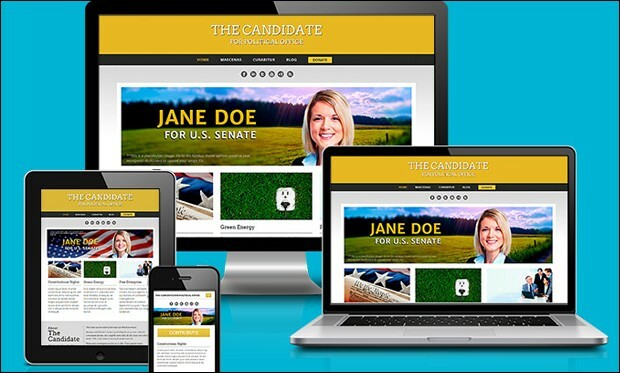 Republican WordPress theme is designed keeping in mind the needs of politicians who want to setup their own site for running political campaigns. This responsive theme is optimized for mobile devices to make your site look perfect on them. It includes social media tools to allow website visitors to share your posts over the social networking platform. It features clean code for fast loading of the website. Democrat is a fully responsive WordPress theme designed for launching political campaign and other political related websites with ease. Accept donations by simply entering the email of your PayPal account. This theme features photo friendly layouts for highlighting images on featured posts, sliders and featured image areas. It features SEO optimization for enhancing the website appearance and ranking on search engines. Libertarian is a beautiful WordPress theme especially designed for launching political websites. This mobile friendly theme looks great not only on mobile devices but even desktop monitor, laptop, tablets and smartphones. It is built with WordPress best practices to ensure compliance and security. By using options panel, you can add or remove sidebars and customize fonts, colours, sizes and select from different layouts. 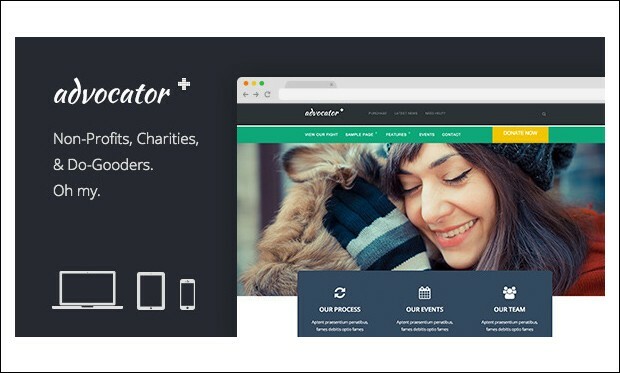 Advocator is a stylish WordPress theme that can be used for building political, charity and non profit websites. It is built using the Zurb foundation 5 framework by professional WordPress developers. You can customize each and every element of the theme with the help of unbranded theme options panel. Different post formats are standard, aside, images, quotes and links.